Ford Motor Co. announced today that the Michigan Assembly Plant will build the 2012 Ford Focus, as well as hybrid and electric versions of the compact car, on the same assembly line. Ford spent $550 million to gut much of the plant that made full-size Ford Expedition and Lincoln Navigator sport-utility vehicles until November 2008 and reinvent it as a flexible car plant. Volume production of the 2012 Focus begins on two shifts Jan. 3 with workers from the Wayne Assembly plant that made the outgoing Focus until Dec. 3. At the end of 2011, Ford will add production of the Focus Electric, which runs on batteries and will compete against the Nissan Leaf. 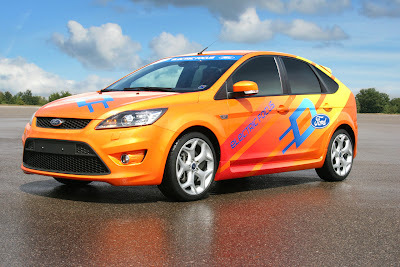 In 2012, a plug-in Focus hybrid will be added; it will run on electricity.. The Fusion hybrid runs on electricity alone to 47 miles per hour, and then the gasoline engine kicks in and the car operates as hybrid. There also will also be a conventional hybrid version of the Focus. Ford officials say it will be one of the most advanced plants in the industry because of its ability to make four different compact vehicles, including three with some electrification. "We've modernized just about every square inch of this facility to establish a new standard for a high-tech, green, flexible and efficient auto factory," said Jim Tetreault, vice president in charge of North America manufacturing. The plant, as well as the vehicles it will produce, will be green. A 500-kilowatt solar panel system — Michigan's largest — will be installed to help generate renewal energy for production of the Focus models. Ten new electric vehicle charging stations on the property will be used to recharge the electric trucks that transport parts between adjacent facilities. The refurbished factory, with 1.2 million square feet, is Ford's most flexible, high-volume and modern manufacturing facility. "If the last few years have taught us anything, it is that customer wants and needs can change quickly — much more quickly than we have been equipped to efficiently respond to in the past," Tetreault said. "At Michigan Assembly, we will achieve a level of flexibility we don't have in any other plant around the world, which will allow us to meet shifting consumer preferences in real time."